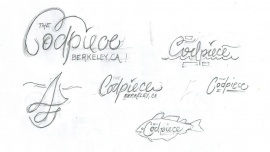 Lettering for sailboat "the Codpiece - Berkeley, CA"
My friend's sailboat docked in Berkeley, CA needs lettering for the back and sides identifying it's name "the Codpiece", which in my opinion is much better then all the lame names surrounding them... how many "Calypso"s can there be. Although a short phrase for this project I am excited to incorporate a classic and possible nautical look to this as well as working within the contraints of limited space. This when finished will be printed on vinyl and laquered to the boat. I will also like to incorporate a limited color pallete to match the overall look of the boat currently, and also stay with the overall feel of the owners/crew. When purchased the boat was a dump, but it is a fiberglass boat from the early 60's and being cleaned up, now she just needs a sparkling new name signage. So I just have been trying some more variations, I will have to go over the sketches with my friends who own the boat to see their take. I like the fish, but that's really just for fun since this isn't a fishing boat.